Here it is! What do you think of the cover? 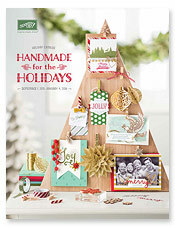 I am so excited for this year's Holiday catalog. Stampin' Up! has put together a wonderful group of products -- something for everyone! Have you received yours in the mail yet? If you are one of my customers who has purchased from me within the past year, yours should be in the mail to you. If you are interested in receiving one, just contact me and I will get one to you. Stampin' Up! 's policies will not let me show you the inside of the catalog but I can show you the actual products. So sit back and get a preview of some of the wonderful product Stampin' Up! is offering this season. Sorry it is so long - there's just so much to show you! Butterflies Dies - All the Fun These Days!